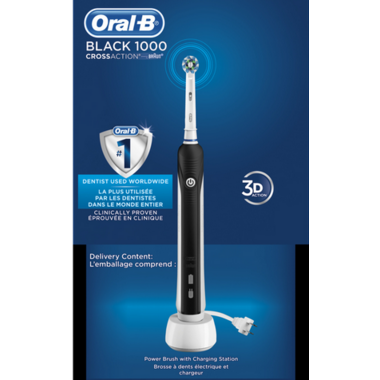 The Oral-B Pro 1000 Power Rechargeable Electric Toothbrush provides a clinically proven superior clean*. The professionally inspired design of the CrossAction toothbrush head surrounds each tooth with bristles angled at 16 degrees and removes up to 300% more plaque along the gum line*. 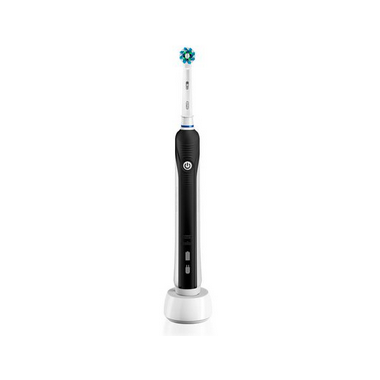 The brush’s 3D cleaning action oscillates, rotates, and pulsates to break up plaque. With a built-in pressure sensor that stops the pulsation movement if you brush too hard, the brush helps protect your gums. The brush has 1 mode, plus an in-handle timer to help you brush for a dentist-recommended 2 minutes. Best of all it is brought to you by Oral-B – the #1 brand used by dentists worldwide.